The Canon A650 is their latest update to the long line of excellent A-Series cameras. 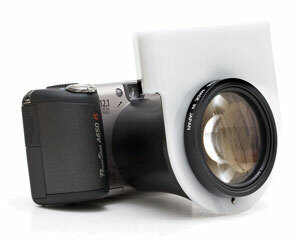 Previous A-Series cameras came with 4x optical zoom lenses. 0.9 inches wide. This is the same size field that our digital SLR cameras will focus to. The LCD screen is the same size as the previous models but is much higher resolution. The A630/A640 screen has 115,000 pixels - the A650 screen has 175,000 pixels. Canon and Nikon have announced new models, but they have both been taking their time in releasing them. The Canon Rebel XSi is set to replace the popular Rebel XTi. As usual, there is a bump in resolution (from 10MP to 12MP) and a larger LCD screen. The big update is a new version of "Live View". This feature allows you to use the LCD screen as a viewfinder and it appears that (unlike the 40D), you will be able to use Live View in autofocus mode. We will know more as soon as Canon begins shipping the XSi (hopefully in the new few weeks). Nikon also announced the D60 which will replace the D40x. Although very little has changed, the few changes are useful for dental photography. Nikon has added a sensor cleaning system (to help keep dust off of the sensor) and a white balance adjustment system very similar to Canon's. Like the D40 and D40x, the D60 will only work in autofocus mode with Nikon lenses that have the focusing motor built into the lens. Otherwise, it is manual focus only. This is not a problem for clinical photos, but if you use the camera recreationally, you may need to purchase new lenses if you want autofocus. The Nikon D60 will start shipping soon, but only in kits (with an 18-55mm lens). Nikon says that the D60 "body only" shipments will start in July. If you would like to pre-order either camera, please call us at 800-998-7765. As soon as these cameras are readily available, they will both be on our website. in Anaheim, May 2-4. We will be in booth #2034. Canon Rebel XSi (if Canon can ship them in time! ).